￼ Sedaru Services (formerly known as IDModeling) team brings hydraulic modeling and engineering perspective to the market. Sedaru uses the latest advances in water distribution system hydraulic modeling software, proven and tested hydraulic operational techniques and software applications, complemented by core competencies in GIS and water system hydraulics. Sedaru is a recognized leader in hydraulic modeling and utility management. Our team serves on the Engineering Modeling Applications Committee and Strategic Asset Management Committees of AWWA, and have co-authored AWWA M32 Computer System Modeling Manual of Best Practice, Hydraulic Models and GIS, and other industry standard manuals of best practice. Model calibration for steady state, extended period simulation (EPS), and advanced EPS. Development and application of hydraulic models for planning, operations and design, including and not limited to water quality, capital improvement planning, energy management, and more. Training, workflows, and documentation to support communications and ongoing quality assurance and sustainability of deliverables. 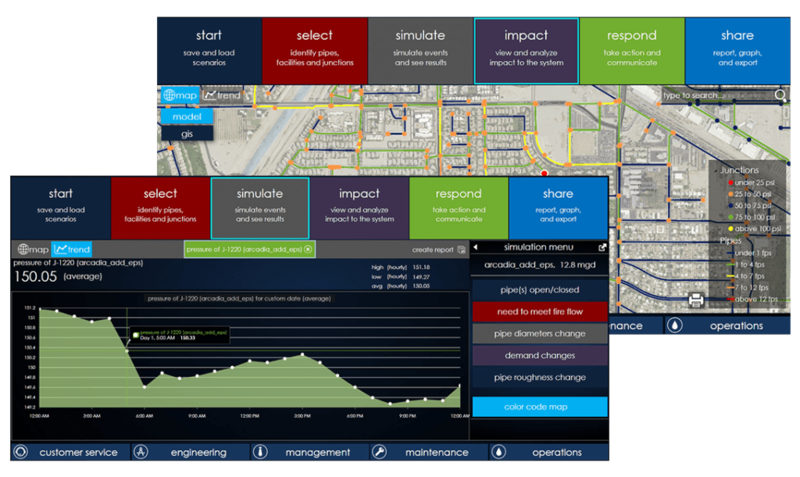 Software tools and technology to leverage available data sets, including GIS, hydraulic modeling O&M data and more, that could be used to support more informed decision making at the engineering and capital planning level.